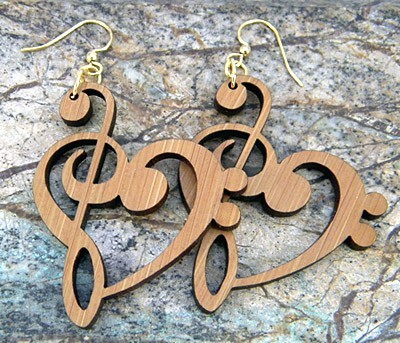 Music Clefs Wood Earrings – These amazing Treble Clef Wood Earrings make a wonderful music gift for any musician! The custom etched wood earrings feature intricate details and is fashioned with a treble and bass clef together to form a musical heart. Created from all natural wood and renewable/recycled materials. Made in the USA. Approx. 1.8″ x 1.5″. Cool Music Jewelry for Musicians!